Merino, a town in western Victoria, is 20 km south-east of Casterton on the road to Portland. White settlement in the Merino area first occurred with Francis Henty’s Merino Downs pastoral run (1837), so named because Henty first stocked it with Merino sheep. A settlement formed in the early 1850s where the Casterton to Portland track met the junction of the Palmer and Merino Creeks. First known as Paddy’s Waterholes, a store was opened in about 1854 and a hotel was opened in 1856. The township was surveyed in 1857. Its growth was apparently quite rapid as censuses of 394 and 604 were recorded in 1861 and 1871, although the figures probably included outlying populations. A flour mill was opened in 1857 (before the mill in Casterton) and Anglican and Presbyterian churches were opened in 1866 and 1868. In 1870 a pastoral and agricultural society was formed, and a Methodist church and a mechanics’ institute were built. 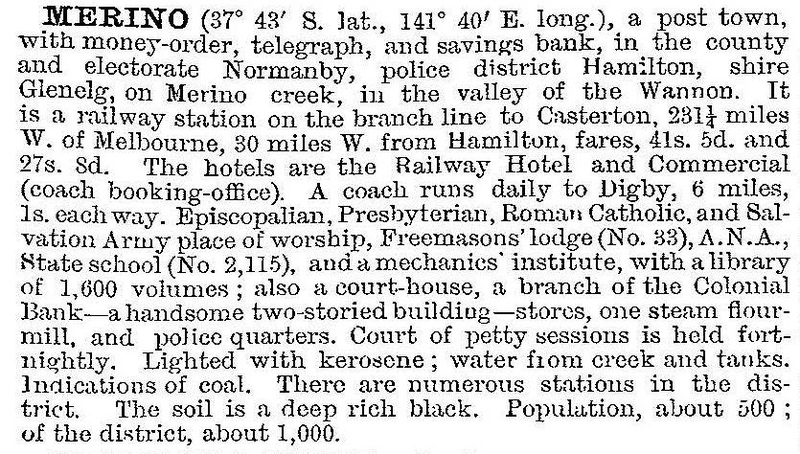 In 1884 a railway line was opened from Branxholme to Casterton via Merino. Annual rainfall at Merino is a little more than Casterton’s, enough for dairying to be run profitably. A butter factory was opened in about 1908. Soldier settlement farms were taken up from the subdivision of some remaining pastoral estates after World Wars I and II and, although the increasing population only slightly outpaced the consolidation of earlier farms, there was a generally more prosperous farm economy. A new public hall was built in 1930 and Merino took the lead in developing a consolidated district school (1952). Dairy rationalisation, however, led to closure of the butter factory in about 1967 and the railway line was closed in 1977. Merino’s participation in overseas war service is estimated to have been up to 80% of eligible enlistments for 1939-45. Memories of the previous war were preserved by the Paschendale soldier-settlement area north-east of Merino. In addition to its RSL hall, Merino has a bush nursing centre, Anglican, Catholic and Uniting churches, a showground, a recreation reserve, a swimming pool, a hotel and a general store. In 1998 there were 70 pupils at the consolidated school and in 2014 there were 32. At the 2011 census, farming accounted for 34.2% of employment.